White House national security adviser John Bolton told Russia's ambassador on Thursday that better relations between the two countries required addressing U.S. concerns on election meddling, a chemical attack in Britain, and the situations in Ukraine and Syria, the White House said. 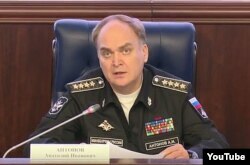 Russian Deputy Defense Minister Anatoly Antonov is seen speaking at a briefing in a screen grab taken from video from the Russian Defense Ministry's YouTube channel. Bolton told Antonov it was in the interest of both countries to have better relations, but Russia must address allegations that Moscow interfered in the 2016 U.S. election and poisoned a former Russian spy in Britain, the statement said. Moscow has denied both allegations. The statement said the United States also had concerns about the situations in Ukraine, where Russia backs separatists, and in Syria, where Moscow's military support has tipped the balance in favor of the Damascus government in a seven-year-old civil war.